I’ve been humbled by reviews of my book Your Wife Is NOT Your Sister. 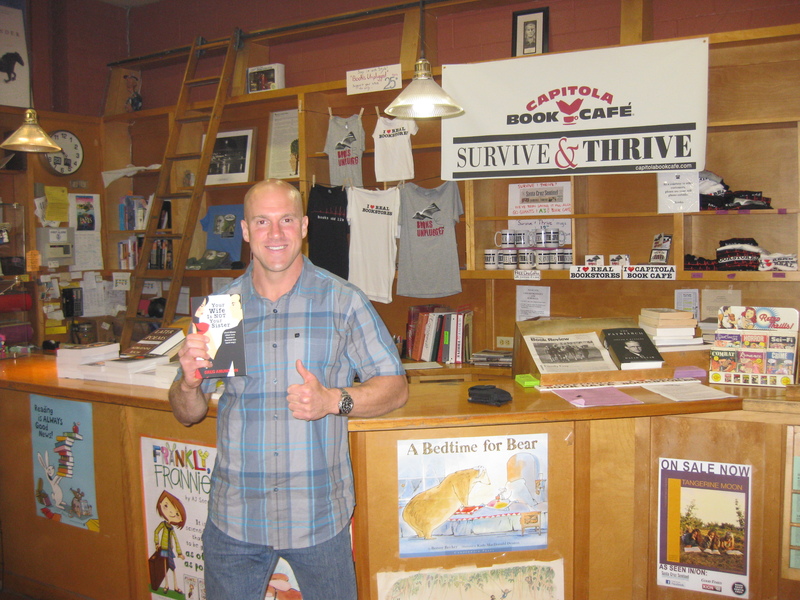 On Friday, December 14, 2012, in front of a crowd of over sixty people, I read two chapters from my book and spoke about the challenges of the writing process. Although not anticipated, I’ve discovered that many men (and women too!) have been guilty of making the same mistakes I did. It is my hope that with Your Wife Is NOT Your Sister, people would empower themselves with the knowledge I sadly learned the hard way, leading to increased love and romance in their relationships. Your Wife is NOT Your Sister was not a book I intended to write. I tell my friends and family the first few chapters were my attempt to answer the question: What happened to my marriage? I had been a model of success in school, athletics, business and finance, and I had risen to the top of two simultaneous careers in Military and Federal Law Enforcement. Yet I had failed where it mattered most. Determined to process and learn from my mistakes, I started to write. After I finished the first chapter titled, In Public Always Let Your Wife Win, I e-mailed a PDF copy to my three younger brothers, Erik, Stephen and Mark, and to my good friends Jeff Martone and George Ryan. Within just a few hours I received phone calls from them all with encouragement to continue writing. Over the course of two months I poured my heart and soul into the pages of Your Wife is NOT Your Sister. I found comfort in writing and was able to channel much of my heartache into capturing on paper the lessons I’d learned about love, albeit the hard way. The writing also provided me an opportunity to reflect on my amazing parents, Raymond and Julie Amundson, their loving marriage and the lessons they taught my younger brothers and me during their lifetime. As the book neared completion, I sent copies to friends for their review and feedback. I felt certain I was alone in the mistakes I’d made. However, I was shocked to discover many of my friends were deep into making the same mistakes I had made. They told me how much the book had helped them through their own heartaches, saved their marriages and relationships, and even reconciled separations and divorces. 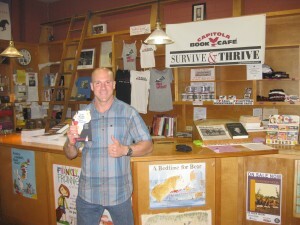 The thought that my book could ultimately help people was the encouragement I needed to publish the work. 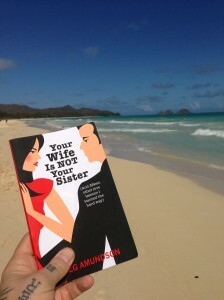 I sincerely hope you enjoy reading your copy of Your Wife is NOT Your Sister. I believe there is a lesson in this book for everyone. I hope you can join me on December 14, 2012, at my gym CrossFit Amundson in Santa Cruz, CA., from 6:00 to 7:30 PM. I’ll have discounted copies of my book available for sale. I’ll also be reading a few of my favorite chapters and will discuss the writing process. The gym will be providing catered food and drink from Whole Foods Market. This will be a night to laugh, share stories and hear about love lessons learned the hard way. 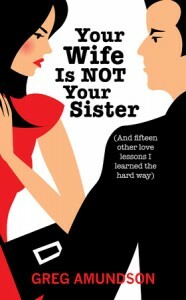 I am thrilled to announce that beginning on Monday, November 26, 2012, my new book Your Wife is NOT Your Sister will be available for sale at Bookshop Santa Cruz and Capitola Book Cafe. The success of my book has been incredible. Amazon sold out within 48 hours and the 10 personal copies I made available at Firebreather Athletics were purchased in a mere 7 hours. 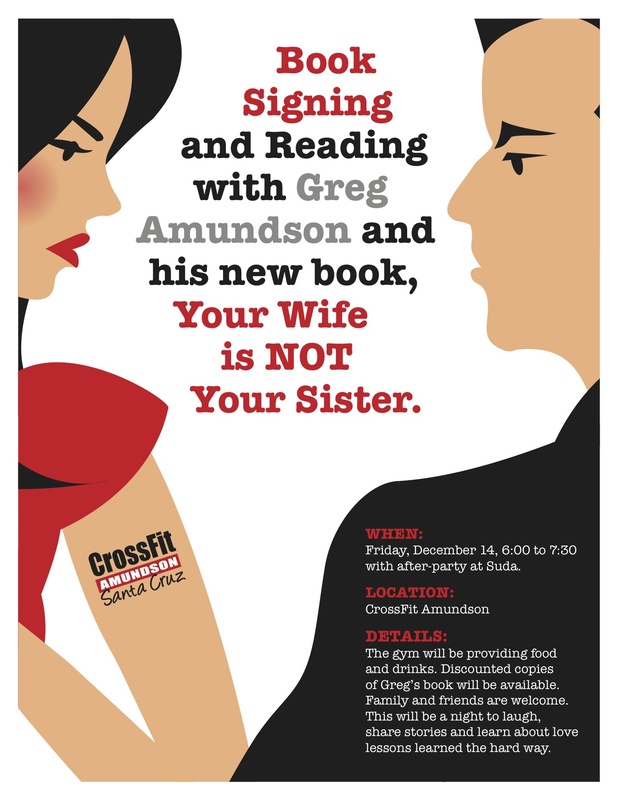 For friends in Santa Cruz, my gym CrossFit Amundson will be hosting a book signing and selected chapter reading on Friday, December 14, 2012 from 6:00 PM to 8:00 PM. The gym will be providing food and drink!